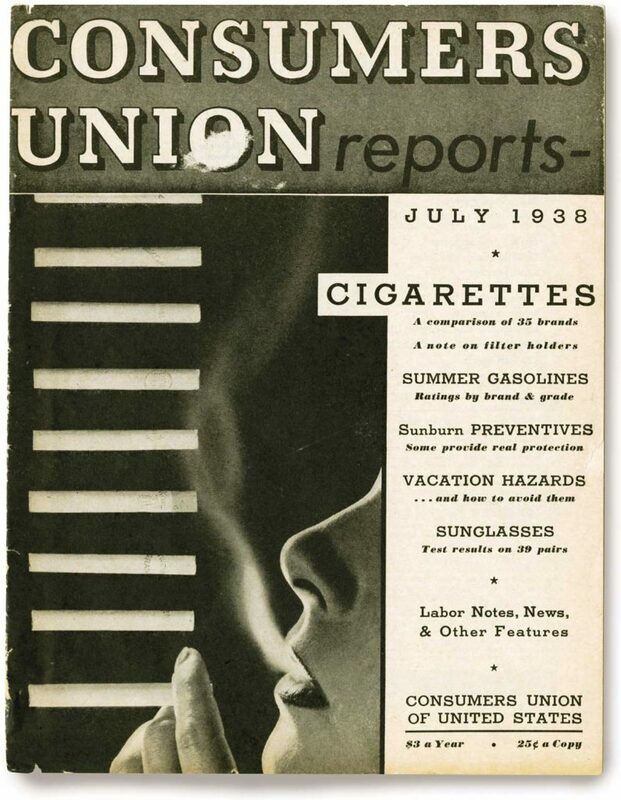 The “Consumers Union of the United States” was founded in 1936 and began to issue its famed Consumer Reports magazine to test and rate consumer goods and services for buyers. The group was the product of a new form of business thinking that focused on the interests of consumers and sought to discourage industrial and commercial deception. In a word, it promoted consumerism. The idea developed steadily from the later-1800s, the period when the first laws came into force to regulate consumer products, especially food, and rein in egregious examples of consumer fraud or gouging. The group continues its good work to this day but was reorganized in 2012. A separate company now publishes Consumer Reports and maintains an active web presence; the original Consumer Union now focuses on public advocacy and research. 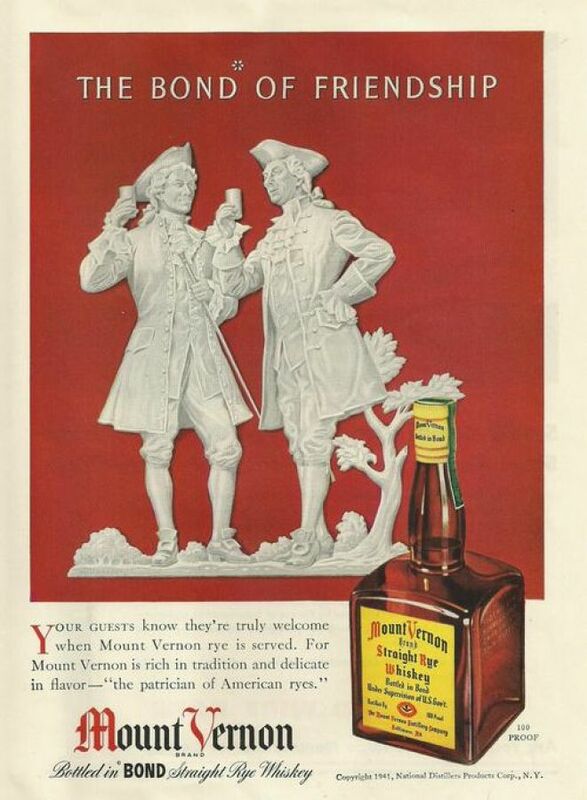 In 1941 the Consumer’s Union issued its fourth Wines and Spirits report with content dating from November 1940. The publication, despite some inevitable period language, has a modern look and feel. The product comments are not as detailed as in today’s reviews (book, magazine, online rating service, etc.) but are clearly progenitors. I think, too, one can see the influence on the Zagat restaurant review series. The signature was presenting a serial list of reviews, each short and impactful, and then providing a rating. James D. (“Jim”) Robertson’s 1978 The Connoisseur’s Guide To Beer, an early modern consumer beer book, also seems influenced by the Consumer Reports style. Consumer Reports was always notable for not pulling punches and no-buy recommendations are included from the early reports. The Wine and Spirits report is very interesting. First, there was the shadow albeit lessening of National Prohibition, which ended only eight years before. Second, the dampening effect of the Depression was still operating although it’s something to be intuited in the report vs. being clearly stated. Then as now, New York City, where the Union was based, had the money to indulge the best but a prosperous middle class had continued through the Depression and one senses it was the main audience for the reports. Perhaps the most important external factor was what the report termed the “war in Europe”, a literally true statement as the Japanese bombing of Pearl Harbor was still in the future. America was thus at peace but the war had many effects. These included the cessation of wine and brandy shipments from France, Italy, and Germany. Prewar stocks were going fast. The report stated this provided an opportunity for California vintners, who indeed finally got their due but probably much later than the report authors thought. Yet, for the time, Consumer Reports was surprisingly bullish on California wine, calling the best of it “really good” although always placing Europe in the front rank for the topmost end. Some faith was placed in Argentina as an influential wine country. Indeed this happened also, finally. Chile was not mentioned at all. The report bemoaned the shortage of French brandy and dismissed the California product as clearly inferior, in part because too young. Each section is prefaced by a detailed and accurate summary of the product type. Whisky is given a full treatment, especially Scotch whose lustre was possibly at its apogee in America then, continuing a success enjoyed illicitly during the Volstead era. Canadian whisky is given short shrift, basically. It is termed “extremely light” and its value questioned in relation to price; American blends were held up as better value. If there was a quality difference resulting from the fact that the neutral grain spirit element in Canada was aged in wood but unaged in the American blends, the report didn’t pick up on it. In this regard, the report seemed unprophetic, as Canadian whisky continued to grow by leaps and bounds in the U.S. from the 1930s until today. The report contains what may be, with other early Consumer Reports on the same subject, the only extant reviews of the Canadian straight whiskeys then on the market. One was Pedigree Rye from Seagram at 8 years old, the other was a 5-year-old rye also from Seagram, probably the same whisky but three years younger. The reviews state that these were straight whiskeys, comparable to U.S. straight rye, and the light character of Canadian whisky really applied to the blended form, e.g., Seagram VO. But the report deprecated the price of these straights (“excellent – but overpriced”). It reflected, largely, the customs duty Canadian whisky had to pay to enter the U.S.
Clearly, the report liked the Canadian straights but felt they weren’t the value they had been when there was still a shortage of bonded U.S. whisky after Repeal. As seven years had elapsed since 1933 American rye and bourbon had time to regain their traditional character yet Pedigree was still more expensive. The authors clearly were straight whiskey devotees who appreciated body and character, words that recur in their commentary. Sometimes a taste note is included that could have been written yesterday. The panel grumbles that Old Overholt Straight Rye seemed changed in character, for example: “This brand has changed considerably during the past year. Although it is still well made, it lacks the characteristic brand flavor it once possessed, and is much lighter-bodied”. Things are always getting lighter and not what they used to be, even in 1940! Certainly the report liked the (American) Finch’s Monticello Straight Rye, calling it “heavy” and well-made. The report tartly observes that Mt. Vernon Straight Rye sometimes uses distillate from other than Mt. Vernon distillery and its rating should be considered applicable only to the genuine Mt. Vernon stuff. Quite modern-sounding, again. Now we’ve got to find the beer report, but how? There was at least one, I know, issued c.1949, and the Union probably had dealt with beer much earlier. One can just imagine how some of it went: “Ballantine IPA has the character of the best pre-Prohibition “stock”, or India pale, beers. Expensive but worth it.”. 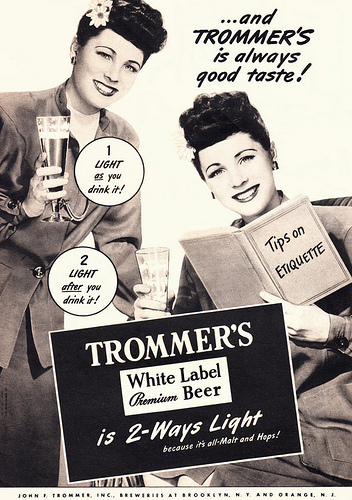 Or, “New York’s Trommer White Label lager retains the quality of German beer due to its all-malt construction; a high rating is in order”. Or, “Eichler’s lager in the Bronx seems reduced in body from the straw-boater days, we rate it at par”. And so on. Note re images: The early cover of a Consumer Reports magazine was sourced at this Consumer Reports website. The second image was sourced at this flickr site, here. The third, here. All trademarks shown belong to their owners or duly authorized licencees. Images are believed available for educational and historical purposes. All feedback welcomed.